Kitchen pharmacy meets green cleaning and natural beauty in this comprehensive handbook of 501 recipes that harness the power of plants to enhance wellness and toxin-free living. Expert herbalist Pip Waller provides a wealth of information about growing, collecting, preserving, and preparing herbs for a variety of purposes--from cleaning products, to food and drink, medicines, beauty products, and more. 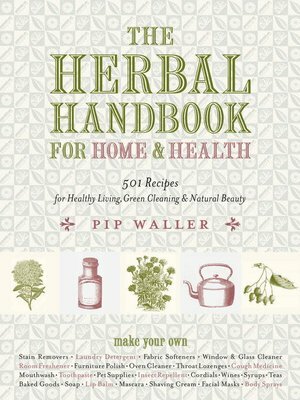 Attractive and easy to use, The Herbal Handbook for Home and Health includes growing tips and proﬁles of herbs, guidelines for setting up an herbalist's kitchen, and techniques to make everything from tinctures to tonics. A valuable resource for anyone affected by allergies or sensitivities, this compendium is handsomely produced with two-color printing throughout and more than three hundred striking illustrations. The Handbook includes contributions from herbalists from around the world and encompasses recipes that range from very simple to more complex. Seasoned herbalists as well as those just beginning to explore the world of herbs will find something to start their own nontoxic, non-allergenic domestic revolution.